Pregnancy is a tricky little minx because it lies to you constantly. I’m assuming this is a character flaw of pregnancy as an institution rather than the child that’s currently being knit in my womb. Though, I was quite the liar myself growing up, so maybe these are the first blushes of what is to come. Regardless, the lies are of the cruelest nature: surrounding food. Pregnancy deceives you by telling you don’t enjoy eating something that you do, or worse, convincing you that you’ll enjoy something that you don’t. I’ve really had a great first trimester. Some exhaustion (combated fiercely by lunchtime naps in various parking lots throughout the city – libraries, churches, Target – even once, the handicap stall of my office building), some nausea that settled in all day every day for about three weeks, but no throwing up, and little to few true food aversions or strong cravings (minus one fateful Tuesday when I would have punched my own ovary to eat some pepperoni… but not just pepperoni… pepperoni bread… namely the kind from Great Harvest. Arguably just a loaf of pizza, but that day, it seemed more like a gateway to heaven. And despite my adoration for charcuterie, there has never been the slightest hankering in my spirit for pepperoni in my previous 27 years, so I will resolutely blame the baby). Despite the lack of aversions (the smell of wine or thought of drinking wine is really the only one, which is probably a blessing – I haven’t forgotten you Shiraz! Shiraz actually seems like a name we as a culture might bestow on a helpless baby. Yes. Shiraz Malbec Arey. I like it. ), some things have just been tough to eat or unappealing to me. Vegetables, particularly, have lost their allure. As a once avid vegetable eater I’ve struggled to masticate my way through roasted broccoli, Brussels sprouts or even kale chips the past few weeks. But pass me a Strawberry Newton, honey, and game on. Also there was that brief and torrid affair with Honey Bunches of Oats. But fruit, man, fruit has been the golden ticket. Apples, bananas, strawberries, cherries, snozzberries, peaches, even blackberries – previously a love-hate relationship, at best. 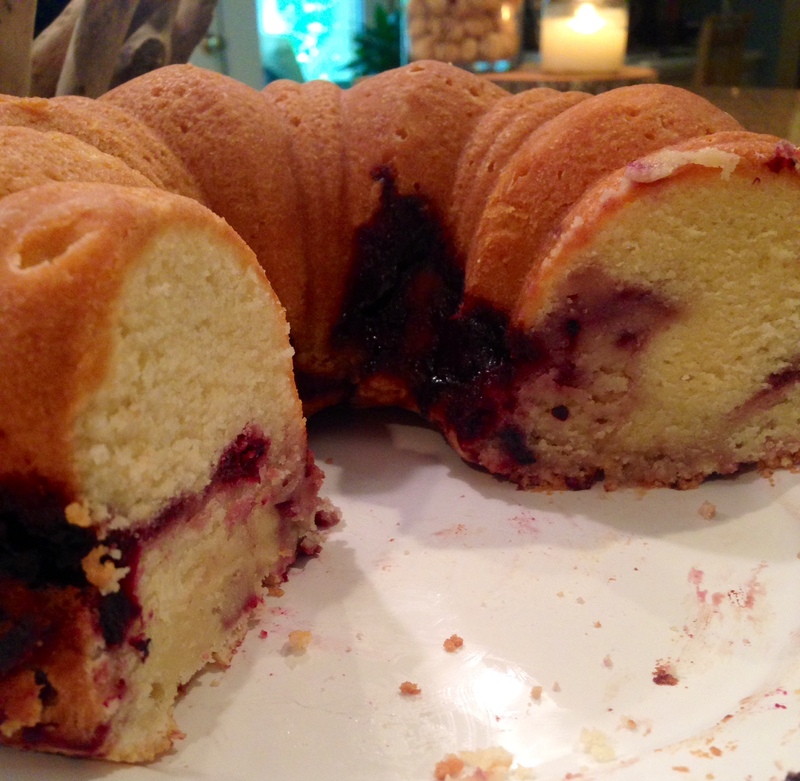 To test my fruit-loving embryo’s brain cells I hid this week’s haul of the blackberries inside a pound cake and the end result for the cake, myself, and the child was a resounding “more.” Which I only gave into once. So far. Preheat oven to 425. Arrange berries on a small baking sheet or in a small baking dish. Sprinkle berries with brown sugar and balsamic vinegar. Roasted 10-12 minutes. Remove from heat, transfer to small bowl, sprinkle additional brown sugar over berries, as desired, and roughly mash with a fork leaving some pieces of berry intact. Set aside. Lower oven heat to 350. In a mixer, cream butter and shortening. Add sugar a half cup at a time. Add eggs, 1 at a time, beating thoroughly after each addition. Add dry ingredients a little at a time, alternating with the addition of milk. Start and end with the dry ingredients. Mix in vanilla. Pour half of batter in a greased and floured bundt pan. Add blackberry mixture and swirl into batter. Add remaining batter on top. Bake 60-90 minutes until cake is golden.